Major-General Frank E. Stoner was the Chief of the U.S. Army Communication Service during World War II, and as such was responsible for building the long-distance and high-capacity communication networks required to direct a global conflict. After the war, as the first Chief Communications Engineer of the United Nations, he oversaw the creation of an international communication system established for the keeping of peace. Frank E. Stoner was born in Vancouver, Washington on 25 December 1894. He was educated at Washington State University and the U.S. Military Academy. During World War I, he commanded the 14th Philippine Scouts and Wire Company, 1st Philippine Field Signal Battalion. On 31 August 1917, he married Deah Gilroy. From 1919-1928, he was the company commander and regimental adjutant with the 46th Infantry and 1st Infantry, Second Division, 7th Signal Service Company, Eighth Corps Area, and others. In 1928, he graduated from Signal School, and was the officer in charge of the War Department Message Center and Radio until 1932. The summer of 1930 saw Stoner — now a captain — at the Army Message Radio Transmitting Station (WAR) at Fort Myer, Virginia. From 1937 to 1939, Stoner was the executive officer of the Army Signal School at Ft. Monmouth, New Jersey. 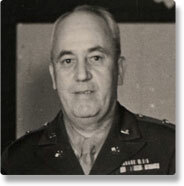 In February of 1942, Stoner was appointed Chief of the Army Communication Service of the Signal Corps. Under Brigadier General Stoner’s direction, the first 24-hour long-wave circuits across the North Atlantic were set up. These communications circuits were resistant to the magnetic disturbances caused by the aurora borealis, and the reliability of the circuits greatly assisted the task of ferrying much-needed aircraft to Europe. Communication speeds were increased by the use of radioteletype equipment and multiplexing. For ACAN (Army Command and Administrative Net), the Signal Corps built the “beltline,” so-called because it circled the earth near the equator. High-frequency radio in the tropics was subject to less ionospheric interference than in the higher latitudes. ACAN allowed direct communications to ships and planes and to troops at the front, and by 1945 was carrying an average of fifty million words per day. The Signal Corps also provided the communications for the Casblanca, Yalta, and Potsdam conferences of the Allied leaders. On 7 December 1944, Frank Stoner was promoted to Major-General. Stoner’s contributions to winning the war were impressive; his services to peace and postwar society would be equally so. In October of 1946, General Stoner, as the Chair of a panel of radio experts advising the newly-formed United Nations, submitted a report on the establishment of a world-wide independent broadcasting system to the General Assembly, which was then meeting at its temporary quarters at Lake Placid, New York. The first meeting of the UN General Assembly on 23 October 1946 was broadcast in the five official languages over a cooperative network which included the Australian Broadcasting Corporation, Canadian Broadcasting Corporation, the British Broadcasting Corporation, Netherlands Radio, Norwegian Radio, Radio Diffusion Francaise, and Radio Moscow. In April 1947, Stoner retired from the U.S. Army to become the United Nations’ Chief Communications Engineer. When the United Nations moved to its New York City headquarters, Stoner designed and oversaw the installation of a telephone switchboard which at that time was the largest in the state of New York. Stoner designed it to handle the multilingual telecommunications requirements of delegates from the United Nations (then) fifty-seven member nations. Initially supplying three thousand (later expanded to eight thousand) extensions, the switchboard cost $150,000 ($1.4 million in today’s values) and stretched 112 feet (41 meters) in length. The Bell System coordinator for the United Nations, Kenneth Horton, was quoted as saying that the switchboard would be superior to those installed in the Pentagon when it was built in 1943. In May of the following year, the United Nations broadcasting network that Frank Stoner had set in place with such care and foresight was at risk of going silent. For economic reasons, the United States Congress was considering reducing the funding for the State Department channels used to send programs abroad, channels which had been made available to the United Nations. With resourcefulness and ingenuity, Frank Stoner turned to the world’s amateur radio operators to relay the news of the Parliament of the World to the people of the world. Not only was there an elegant grass-roots symbolism in having amateur radio operators serving as a direct link between the United Nations and the people, it would also enable the United Nations to maintain communications in the face of possible interference — whether political interference or from natural causes — in the existing commercial systems. K2UN, with its networks of ham operators, went on the air on 17 May 1948. 1948 turned out to be a busy year for Stoner. In July of that year, the United Nations truce mission had to be evacuated from Palestine. Aboard the U.S. Navy aircraft carrier USS Palau, Stoner was sent to Haifa to oversee the evacuation of the files and records of UN mediator Count Folke Bernadotte’s truce observation mission to a temporary headquarters on the island of Rhodes. At the end of July, Stoner returned to Haifa aboard the destroyer USS O’Hare with sixteen American high-speed radio operators and radio equipment in order to link those UN personnel who had remained behind in Gaza, Tel Aviv, Jerusalem, Haifa, Beruit, Damascus, and Amman with Rhodes via radio. Stoner retired from the UN in February 1950, but he returned that summer to assist in updating its telecommunications systems. In 1962, as a member of the Save the Redwoods League, Stoner was active in the dedication of a memorial grove of redwood trees in Humbolt County, California for United Nations Secretary-General Dag Hammarskjold who had been killed in an airplane crash in Africa in September 1961. Frank Stoner was awarded the Distinguished Service Medal, and was a senior member of the IRE (Institute of Radio Engineers, a predecessor organization of IEEE). He was an Officer of the Legion d’honneur, and a recipient of the Marconi Medal of Service.